Ray Goodwin is the UK’s best known and (many would go so far as to say) foremost canoe coach. For more than 30 years Ray has been introducing people to, and developing people's skills in, the great outdoors. Ray has paddled all over the UK, as well as extensively in Europe. His ground-breaking British canoe journeys include the first circumnavigation of Wales and the first unsupported canoe crossing of the Irish Sea, as well as grueling journeys across Scotland. Ray's experience extends far and wide, with his paddling career having taken him to four continents. Ray’s North American canoe expeditions have taken him south to the Rio Grande and as far north as the Arctic Circle. Ray’s North American exploits been have not been limited to open boats either; in kayak he has made two descents of the Grand Canyon of the Colorado River. A British Canoe Union Level 5 Coach in Canoe, Inland Kayak, and Sea, Ray was the first coach to be assessed to Level 5 in three disciplines. As if Ray's skill and achievements in paddling weren't enough, he is also holds the Mountaineering Instructor's Certificate (MIC). Ray is a 'technical expert' under the UK's Adventure Activities Licensing Regulations 1996 and as such he advises outdoor training centres on safety and good practice in the outdoors. He is an active writer in the field of canoeing with his articles appearing in various publications. Ray wrote two chapters of the BCU Canoe and Kayak Handbook as well as sections in the standard UK textbook on White Water Safety and Rescue. Ray's own book, 'Canoeing', was first published in 2011 (see below for more details) with the second edition being published in 2016. In the 2019 New Year's Honours List, Ray was awarded an MBE for his services to canoeing. 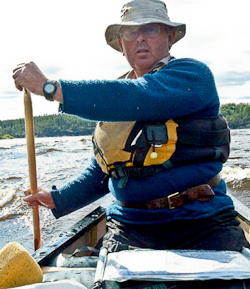 Ray brings his experience and expertise to all of Frontier Bushcraft's canoeing activities, including the Expedition Canoeing Skills Course in the Lake District, River Spey Expedition in Scotland, and The French River and Bloodvein River expeditions in Canada. 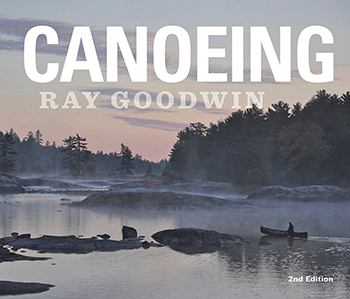 Ray Goodwin's book ‘Canoeing’ is published by Pesda Press. With over 900 photographs used in sequences and photo montages, it is lavishly illustrated and covers all aspects of canoeing. 'Canoeing' is available from good bookstores and Amazon.